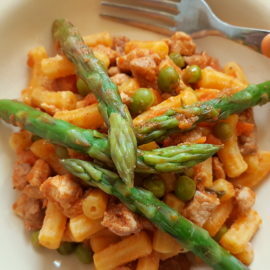 Penne Pasta alla Valdostana, recipe from the Aosta Valley. 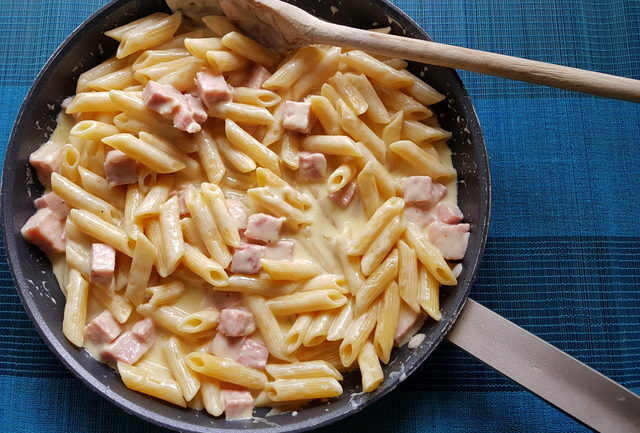 This creamy cheesy pasta alla Valdostana recipe comes from the Aosta Valley in Northern Italy.This region is famous for its cheese, especially Fontina. Most ‘alla Valdostana’ recipes are made with Fontina which is a super melting cheese used in many dishes including Italian fondue. 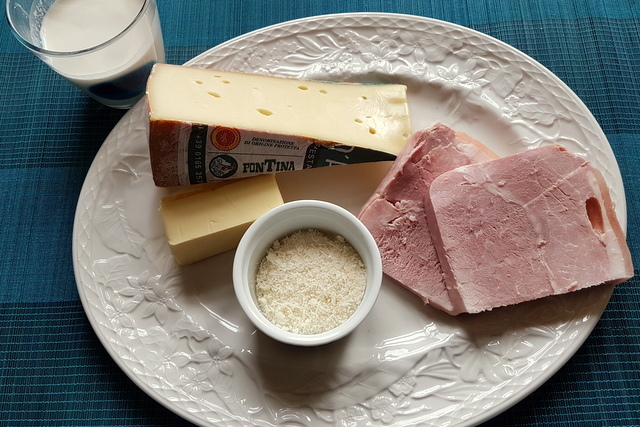 When you see a menu item described as ‘alla valdostana’ in Italy, chances are it’s going to include Fontina cheese and very often ham or mushrooms. Fontina has been made in the Aosta Valley since the 12th century and is traditionally produced with unpasteurized cow’s milk from a single milking. This cheese has a high fat content because it’s usually made with milk from cows which are grazing on flower-filled mountain pastures during the summer! But that’s what makes it melt so well. 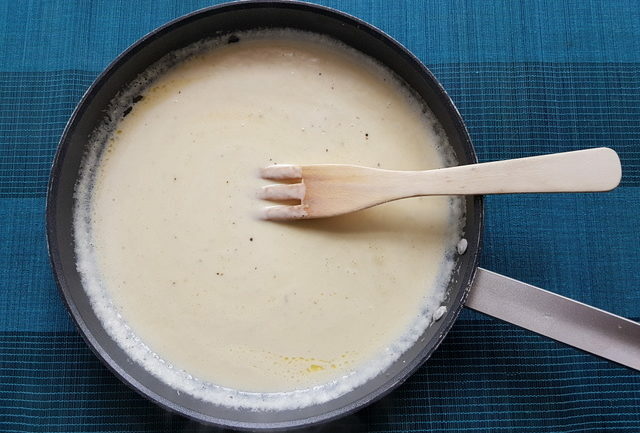 Italians use Fontina for their fondue, which they call ‘fonduta’. 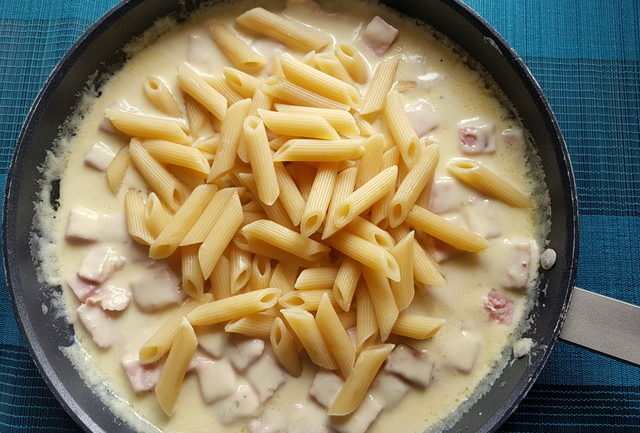 Although Italian fonduta also contains butter and cream, which are not usually added to Swiss fondue. 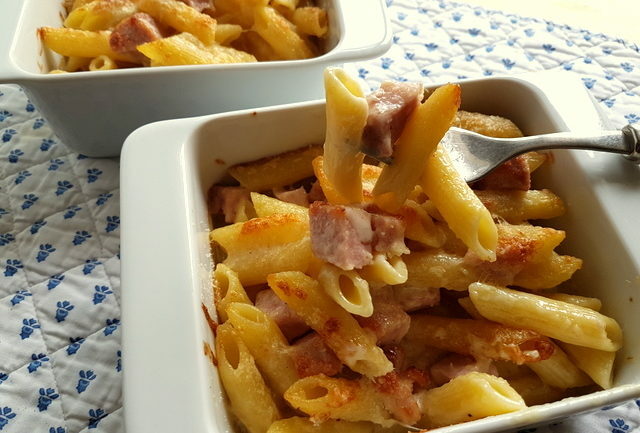 So this pasta alla Valdostana recipe is really pasta in cheese fondue with ham and it is totally divine! 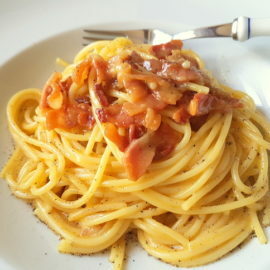 Apart from pasta, there are many dishes called ‘alla Valdostana’. These include chicken breast, veal scallops, steak, risotto and crespelle (Italian crepes). Recipes with chicken or meat usually also contain ham. A bit like the French cordon bleu! So we could also call this dish pasta cordon bleu!! Of course, it’s best to use Fontina cheese but if you can’t find it, Gruyère, provolone, Gouda, or Emmental should work well instead. Italian Fontina has a gentle buttery, nutty flavor and is slightly more pungent than Fontina made in the U.S., France, or other regions of Italy. But, wherever it comes from it’s usually a fabulous melting cheese. This recipe is super simple to make and has only a few ingredients. It can be ready in 30 minutes. 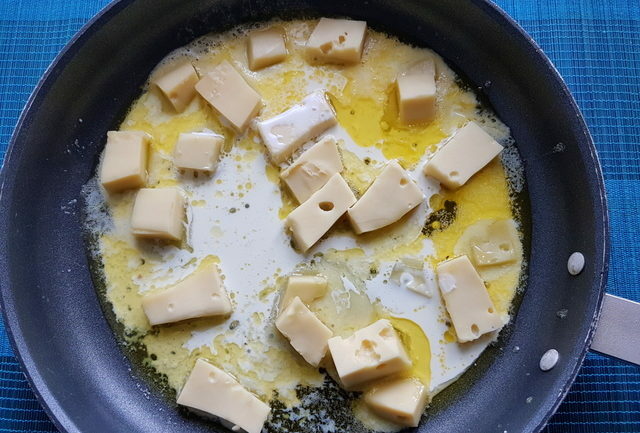 While you boil the water and cook the pasta, just melt some butter in a frying pan or skillet and add the cheese and cream. 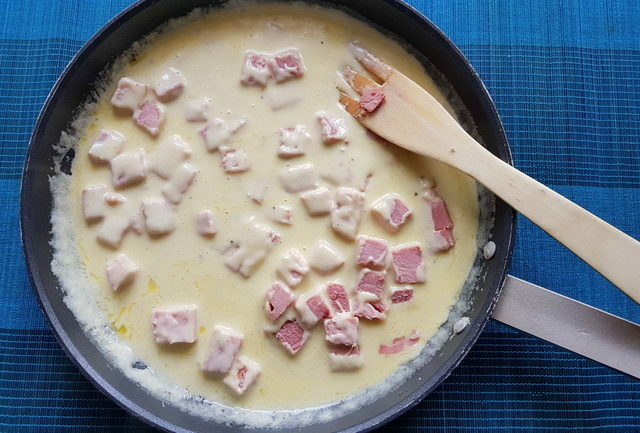 Once the cheese has melted add small pieces of ham! Drain the pasta add it to the sauce. A little pepper and if you like it, nutmeg, and your dish is ready. I sometimes serve it immediately or I bake it with some grated Parmesan on top. Both ways are delicious and baking is a fab way to use up leftovers! I made this recipe with penne but of course most types of short pasta would work well, so you can also use rigatoni, elicoidale, radiatori or farfalle to name a few! I’d love to hear how it turns out if you try this recipe. 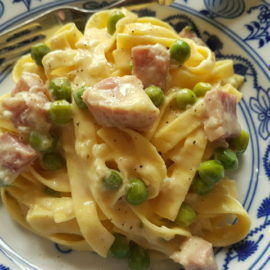 Please leave a comment here on the blog at the bottom of the recipe page or on the Pasta Project Facebook page. 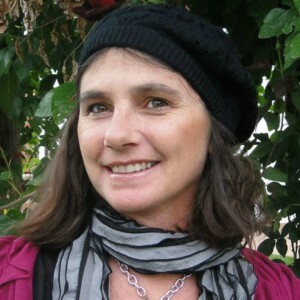 Your feedback means a lot to me. 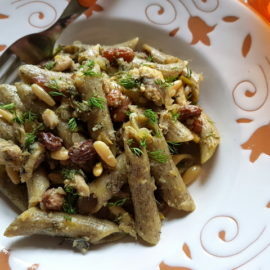 Sicilian Pasta with Sardines and Wild Fennel. I never saw Fontina in our market but Cheese mixed on any pasta is always our favorite. Thanks for sharing. I would love to try Fontina but I’ve never seen it locally in France. 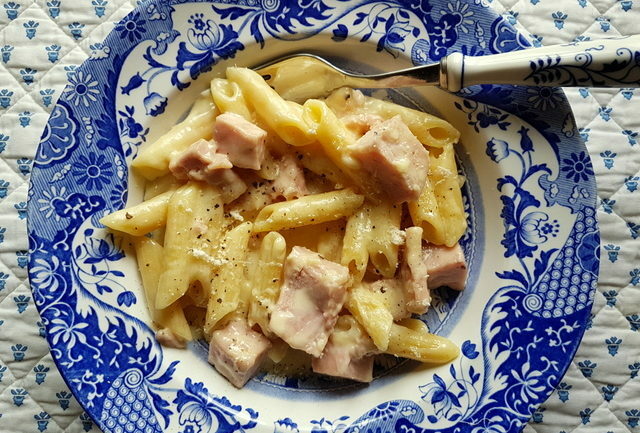 For me, any combination of cheese, ham and pasta is going to be a winner – so delicious! What a gorgeous, gorgeous pasta recipe! I love that creamy sauce… can’t wait to try it. Fontina has been one of my favorite nibbling cheeses for a long time. And I love that it melts so beautifully. Your ham is exquisite!